A new café in Chester-Le-Street is launching its first music night on June 20th, with one of the Britain’s best kept secrets on the roots/acoustic scene. Award winning songwriter Gareth Davies-Jones will visit to tour his eight full solo album ‘The Beauty & The Trouble’, along with support from Durham singer-songwriter Sam Slatcher whose honest and reflective acoustic folk is rooted in the North East’s social and political landscape. The new REfUSE café which serves unwanted food destined for the bin has grown from strength to strength in recent months. Officially launched on the 6th April, the café has been widely visited by local residents of Chester-le-Street and afar, with exceedingly good reviews on the REfUSE Facebook page. 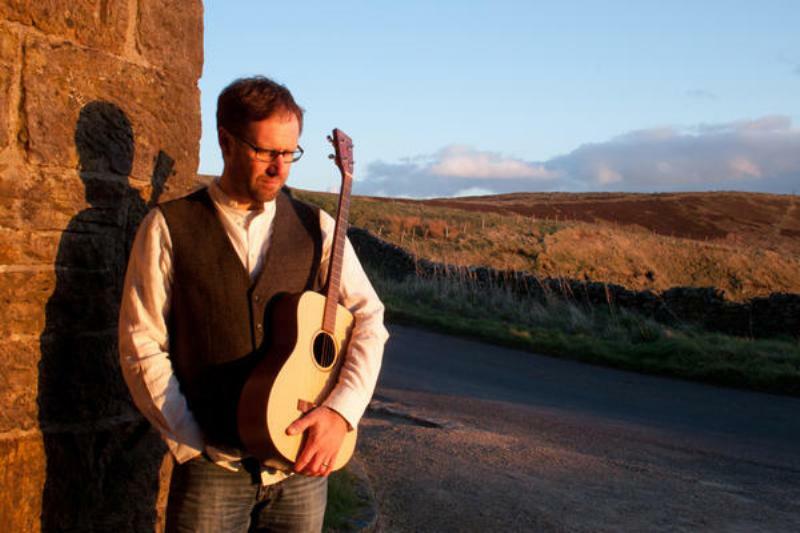 The popular fortnightly restaurant nights every first and third Thursday of the month are also proving popular, accompanied by live music from local artists and bands, including singer-songwriter Steve Pledger (as pictured below on 17th May). The café launches its first Open Mic Night on the 31st May. Visit www.refusedurham.org.uk/ to find out more. Tickets for Gareth Davies-Jones are £8 in advance (or £10 on the door) and details can be found here: https://www.facebook.com/events/1587663358011686/. As part of his Summer Songs series, award winning songwriter artist Gareth Davies-Jones is touring his eighth full solo album ‘The Beauty & The Trouble’. With over a decade of hard graft and experience as a professional musician, writing, recording and playing his way around the UK & Ireland, Gareth Davies-Jones is most certainly one of the best kept roots/acoustic secrets on the British music scene – an artist who has served his apprenticeship well and gathered a discerning following. Held in high regard by many commentators as a gifted and perceptive songwriter (BBC Radio’s Bob Harris, Iain Anderson & Frank Hennessy are all fans), his music is laced with a vivid and powerful sense of the aesthetic, forged amongst the landscapes and atmosphere of his native Ulster and now adopted home in Northumberland. A natural story teller through song, many reviewers have placed Gareth’s performances alongside the best in the Troubadour tradition. Combining elements of Guthrie, Dylan, Taylor and Browne, the attention to musical detail is evident throughout his now extensive back catalogue (8 solo & 3 collaborative albums) playing a variety of instruments and featuring a keen sense of melody woven around a rich, distinctive voice. Visit www.garethdavies-jones.com to find out more about his music and latest releases. Sam Slatcher is an up and coming folk singer-songwriter whose honest and reflective acoustic folk is rooted in the North East’s social and political landscape. Sam has recently released his debut EP ‘In Unlikely Places’ that has not only caught the attention of his growing audience through gigging around the North East, but also by regional media sources following his viral music video to the beautiful folk tune ‘City of Sanctuary’. Visit www.samslatcher.com to find out more about his latest EP. REfUSE is a not-for-profit social enterprise, intercepting food before it becomes waste and turning it into healthy, accessible meals, served on a ‘Pay As You Feel’ basis. Through pop up events, media campaigns, a schools project and a community cafe, REfUSE highlight and challenge the criminal levels of food waste in the UK and give everyone access to basic education on food provision and food waste management. REfUSE are based at 143c Front Street, next door to Argos in Chester-le-Street. The cafe is currently open on Thursdays, Fridays and Saturdays, 10 am – 4 pm. Visit https://refusedurham.org.uk/ to find out more.